Have you ever considered owning a commissioned painting or investing in original art? Perhaps you would like to commission me to paint an original for you, something which is special to you, which will reward you with many years of enjoyment. With painting commissions, I usually find out first what you are looking for in the painting so I can paint exactly what you want: namely, the specifics or characteristics of the painting (i.e. the size, light and shade, colouration, amount of detail required, if it is to be painted in a photorealistic style or something a little more painterly, but still containing detail and realism etc.). For example, if you're looking for a maritime painting which depicts some action and drama (which will always look more impressive than a static shot of a boat), then a photo of the boat in these conditions would be very helpful for me to use as reference (note: please ensure the copyright owner of the photograph grants written permission for me to use the photo for reference purposes). The more information you send me about how you want the painting to look, the better I can visualize how it will appear when it is finished. I usually paint with acrylic paints. A painting, painted with high quality acrylic paints, can take me anywhere between three to six weeks to complete, depending on the size of the painting and the amount of detail required, plus a further two weeks for drying before being given a protective coat of gloss varnish. Painting with acrylics is a much quicker process than painting with oil paints. With oil paints, the pigment is blended with slow-drying linseed oil; whereas with acrylics, the high quality pigment is blended with a fast-drying, odourless acrylic polymer. An oil painting requires the process of oxidation in order for the paint layer to fully dry, which can take up to twelve months before the painting is fully dry and ready for its final varnish. An acrylic painting doesn't require this length of time for drying. All acrylic and oil paintings should be varnished. As is customary in professional painting commissions, as a full time artist I always request a non-refundable deposit of fifty per cent of the total commission fee before I undertake any commission. This advance payment pays for half of the commission and is used to order the materials (i.e. acrylic paints and canvas) I will require for the commission. It also financially covers any invested time, labour and costs already paid for by myself out of my own funds. Once the specifics of the commission have been agreed and you are happy for me to proceed with the painting, I will provide you with an invoice so you can pay the deposit. The invoice will also state the date the painting will be completed by. Once the deposit has been paid, I can make a start and order the canvas required for the commission and then update you regularly by providing you (by email or by post) with photographs of the painting as it progresses; and at any of these stages you can let me know if there is anything in the painting that needs to be altered slightly or painted in a different shade of colour etc. At the end of the day, I am painting this painting for you, so I want to make sure the painting ends up exactly how you want it. I shall notify you within twenty-four hours following the completion of the painting (either by email or by telephone, whichever is preferred) that the painting is ready to be viewed. If you are unable to view the painting in person, I shall mail or email an A4-size proof of the painting to you — and you must then make an approval of the painting based on the proof. If you decide not to accept the finished painting or decide to pull out of the commission at any point, I shall keep the commissioned painting and the deposit. The final payment shall be required in full and be given reasonable time to clear before I can professionally package and dispatch (by courier) the painting to you, or allow you to collect the painting in person, if this is preferred, and thereby grant the right of ownership to you and allow you to keep the painting. All other rights, including copyright, reproduction rights, publishing rights, I retain. 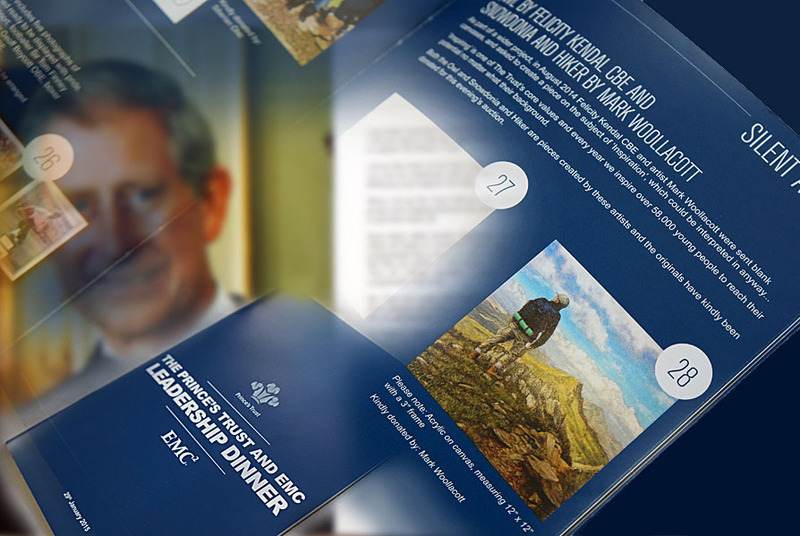 A second invoice will be issued to you so you can make the final payment. A Certificate of Authenticity shall be provided with the painting when the painting is delivered or collected. It is always with the greatest appreciation and gratitude that I receive any painting commission and, as with all my commissions, it will be my standard to undertake and execute your commission with the greatest care, attention, commitment and professionalism in order to produce a painting which will provide and reward you with many years of enjoyment. If you are interested in commissioning me to paint an original painting for you, then please contact me using the email address below and I will be happy to discuss your requirements and answer any questions you may have regarding the commission. I am based in North Devon, South West England. The most important thing about any paint is the quality of the pigment. I use professional grade artist paints called New Masters Classic Acrylics by Old Holland. These paints contain high quality pigments with excellent lightfast qualities. The history of Old Holland Colours goes back to the seventeenth century, the “golden age” of the Dutch masters. The canvases I use are professionally made by reputable UK companies, and are pre-stretched and primed. The prices below refer to the price of the painting only, unframed. Postage and packaging costs are additional and will vary depending on the size/weight of the painting and the location of your delivery address. Typically, Postage & Packing costs for a 16 x 24 inch painting, delivered to an address in the UK, would be £50.00. Please note: if you live outside the UK, you are responsible for paying any local VAT, import taxes, duties, tariffs, holding fees etc. which may or may not be imposed. It is important to hang your painting in the best place and to look after it. Please remember that paintings should not be placed or displayed close to a source of heat, such as a radiator or strong halogen lights, and should not be hung for long periods on a cold or damp wall or stored without any protection in a place, such as a draughty loft or a garage, where dust is likely to settle on it and where it is likely to be exposed to increased heat in the summer months and colder temperatures during the winter months. It is always best to store paintings upright (not leaning) in an environment where the temperature is fairly constant and not liable to fluctuate to extremes. If a painting is displayed, stored and looked after properly, it will remain in excellent condition. As oil and acrylic paintings do not have glass protecting their painted surfaces, it is recommended to prevent dust from settling and accumulating on the surface of your painting by removing it with an inexpensive squeezy dust blower (the kind photographers use to remove dust from their camera lenses) at least once every two weeks. This will ensure your painting will remain in good condition. Alternatively, you can use a soft brush, or a lint-free anti-static cloth for cleaning the surface of the painting and the frame (which is prone to being touched more than the painting's surface and therefore susceptible to fingerprints); but do not rub too hard and do not clean the painting with a paper towel or a sponge. Do not clean or wipe dust from the painting with your bare hands, as they contain natural oils which will transfer to the painting's surface and any marks will colour over time. 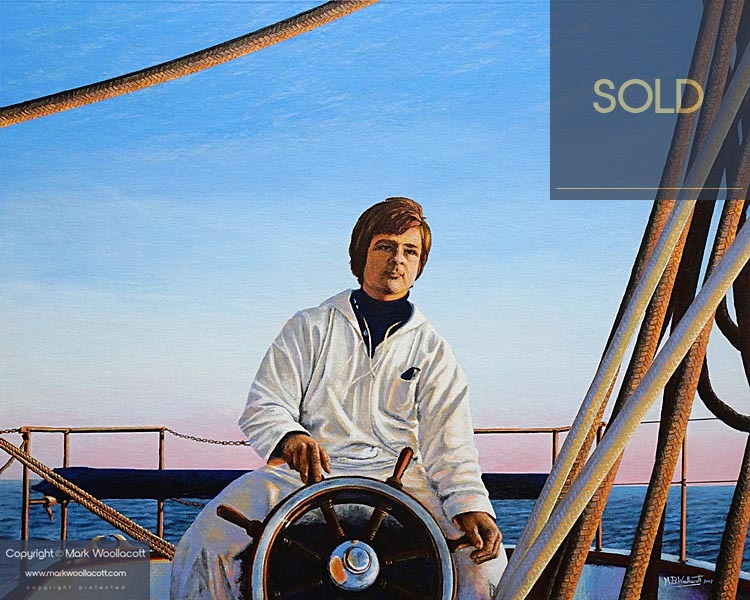 This painting is based on a photographic slide of V. Hanf, taken in August 1974 onboard Sailing Yacht Albatros of HYS (Hanseatische Yachtschule) in the Fehmarn Belt, during the early morning (at sunrise) after having sailed through the night. HYS stands for Hanseatische (Hanseatic) Yacht (ing) Schule (School). Albatros belonged to HYS from 1953 to 1995. Albatros was ordered in 1936 by the Reichs Air Force Ministry, General Christiansen, who lived on the island of Föhr as a training trip for Naval pilots and it was built on the river–shaped fjord by the name of Schlei, as a ketch. It was built from oak larch & teak. Its engine: 125 hp. Its placement thirty tons. After the war it was confiscated by the British and was consequently rebuilt interiorly. In 1952 Albatros was changed to a Bermuda rigging and was given as a donation to HYS, to be used for training trips, where it was a very much loved ship until 1995. Finally it was sold to be a charter vessel on the Adriatic Sea. Painting info: Acrylic on canvas board. Canvas dimensions: 16 x 20 inches. 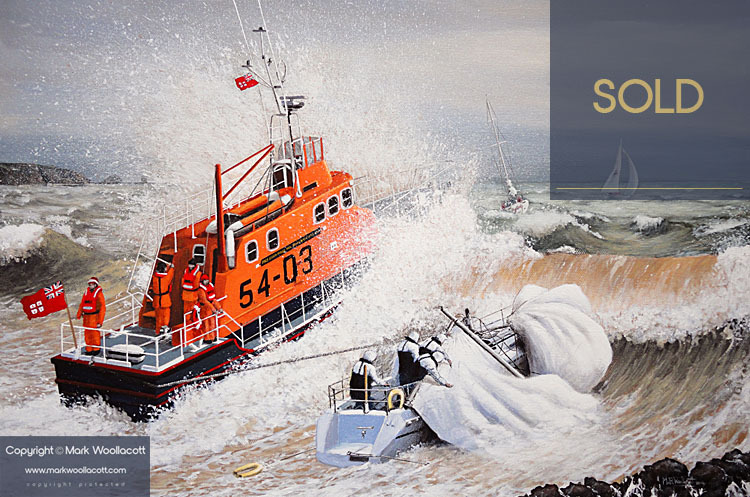 This painting, entitled The Rescue, is based on an original detailed sketch (drawn in 1990 by sailor Mr J Ballantyne) of a real-life rescue that took place off Berry Head quarry, Devon, on 10th September, 1989, featuring the rescue of a dismasted Beneteau Double First 32S5 by the Brixham-based, Arun-class lifeboat, The Edward Bridges. The painting features two additional yachts, Papillion (which Mr J Ballantyne was onboard) and Sigmagnifique. Painting info: Acrylic on canvas. Canvas dimensions: 16 x 24 inches. Available as a print.